Red wines are rich, complex, and can add a whole new dimension to your culinary experiences. Finding out which red wines you prefer can be a fun experiment as you sample what red wines have to offer. Once you know what kind of red wines you enjoy, pair them with complementing foods and share them with your friends. Then, if you really want to deepen your understanding of red wine, try traveling to a winery that offers red wine tastings! 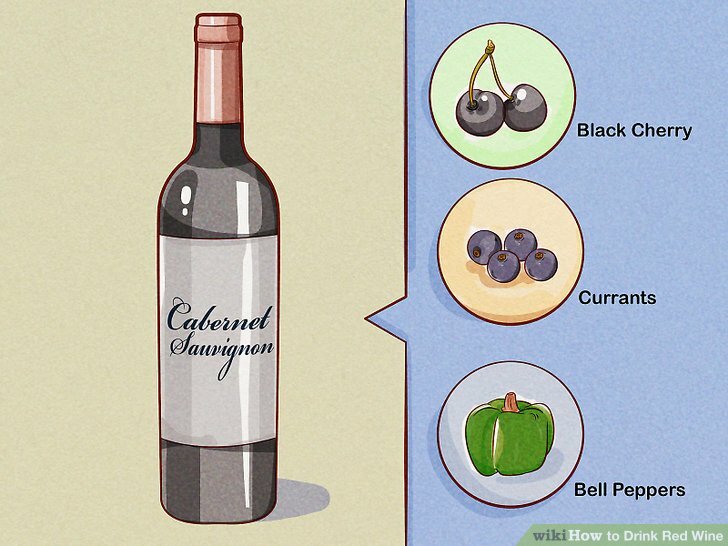 Select a Cabernet Sauvignon for a balanced, classic red wine. Cabernet Sauvignons are very popular and served all over the world. It has flavors of black cherry, currants, and a touch of bell peppers. Often, a Cabernet Sauvignons have a slightly oaky scent with traces of herbs and vanilla. Cabernet Sauvignons are a great red wine to try out because they straddle the line between dry and sweet. Go with Merlot if you want an accessible table wine. Merlots are easy to enjoy and can fit many situations, but they typically lack complexity compared to other red wines. They have rich, fruity flavors that might remind you of strawberries, cherries, plums, and even watermelon. If you tend to have a sweeter palate, Merlots might be for you. Although not all Merlots are sweet, they tend not to have strong tannins, so they won’t create the sensation in your mouth that dry wines are known for. Pick a Pinot Noir if you are looking for a wine with complex flavors. A Pinot Noir can range in flavor and aroma depending on the climate in the region the g****s were grown. They can produce the flavors of raspberries, clove, licorice, cherries, blackberries, plums. Some have hints of roasted tomato, beets, and rose petal. If you are looking for a red wine that encourages you to sit and ponder its flavor profile, Pinot Noir is for you! Grab a Red Zinfandel if you want a dry wine with rich fruity flavors. Zinfandels are known for their dark fruit flavors like black cherry, raisin, prune, and blackberry. They often have smokey and spicy undertones. Their aroma often suggests a swirl of vanilla, jam, and oak. Zinfandels are another great way to begin your exploration of red wines. Their flavors are complex and bold. They also typically have high alcohol content. Try Tempranillo if you seek something less conventional. Tempranillo's originate from Spain and Portugal. They have a spicy, earthy taste with hints of cherry and plum. They often have a smoky fragrance that is similar to unburnt tobacco. 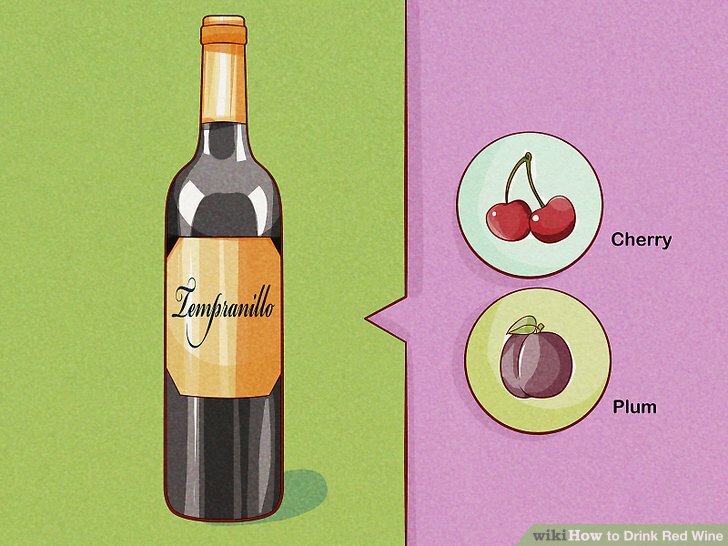 Usually, Tempranillos are fairly dry wines because they have an abundance of tannins. Open your wine. Most wines either have a cork or a screw cap. Caps can simply be twisted off. 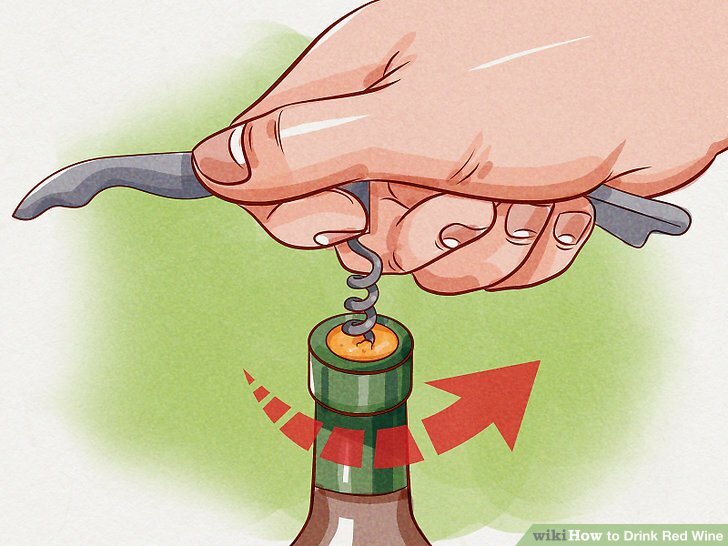 For corked bottles, drive a corkscrew into the center of the cork until the spiral disappears. Then lift up on the corkscrew until the cork is pulled from the bottle. Generally, wines with a screw top are cheaper and more vulnerable to aging. However, just because a wine has a screw top doesn't mean it's a bad wine! Serve the wine at room temperature, or slightly colder. 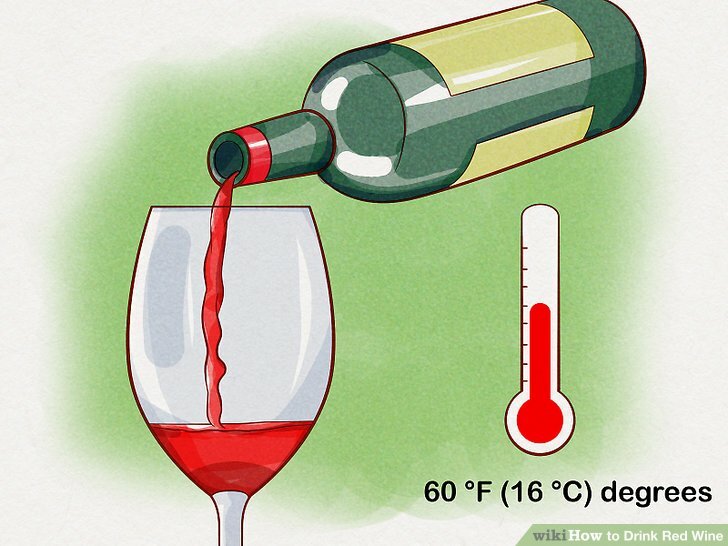 Most red wines should be served at about degrees. If a red wine is served chilled, most of its flavors will be stunted. If it is served too warm, the taste of alcohol might overwhelm the wine’s flavors. 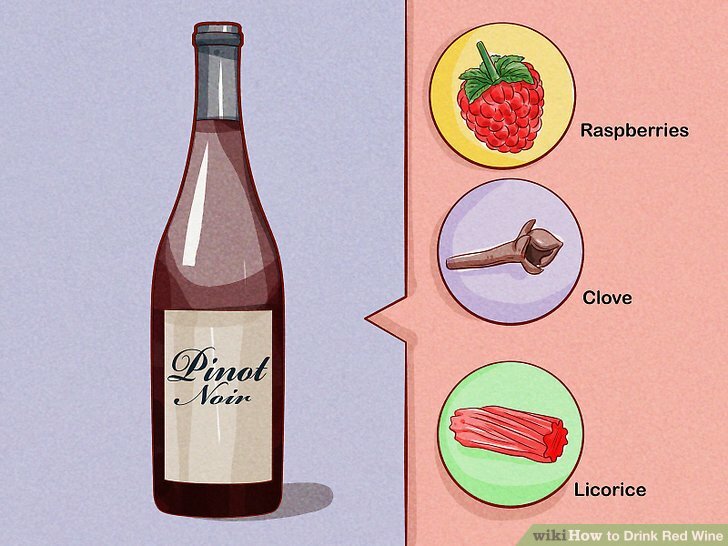 Store your red wine in a cool, dark place to maintain a decent temperature. There are a few red wines that are meant to be served chilled. These are typically sweeter dessert wines or concord blends. If you really want to get into red wines, consider purchasing a red wine fridge that will keep your wines good for longer! Use a red wine glass if you have one. 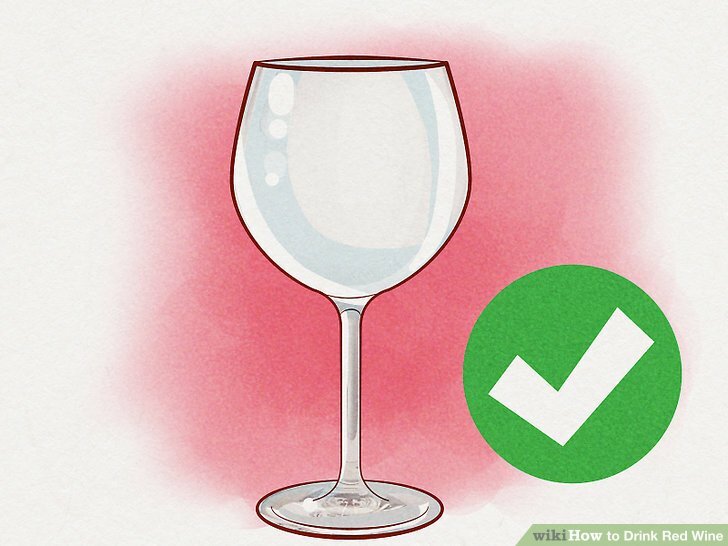 Red wine glasses are shorter and wider than white wine glasses to give the wine as much contact with the air as possible. However, if you don't have a red wine glass, any wine glass or slightly rounded glass cup will do! 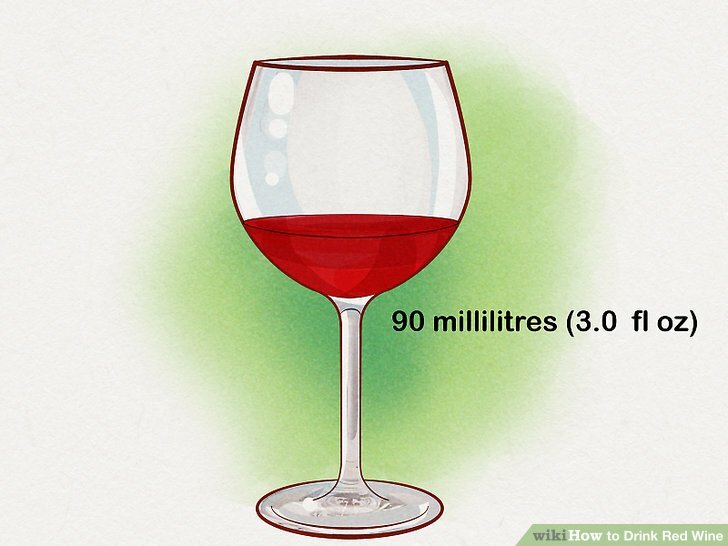 Pour wine until the glass is about 1/4 to 1/3 of the way full. 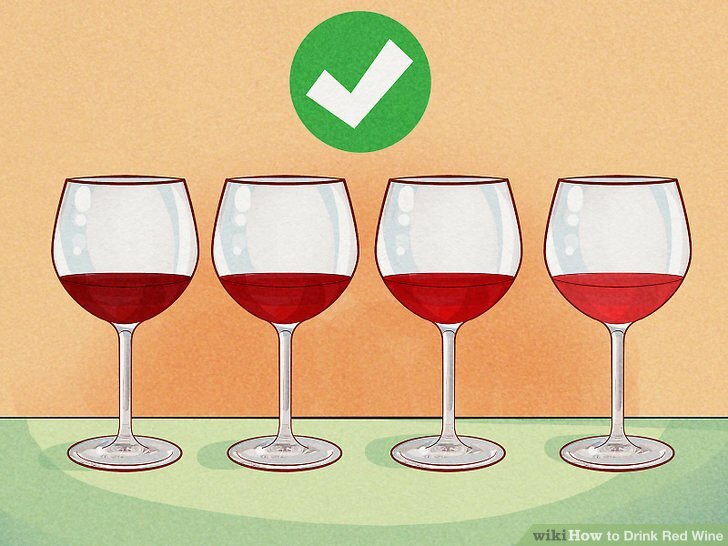 When tasting a wine, a standard pour is around half the size of a normal pour. Typically, this means you will pour about . 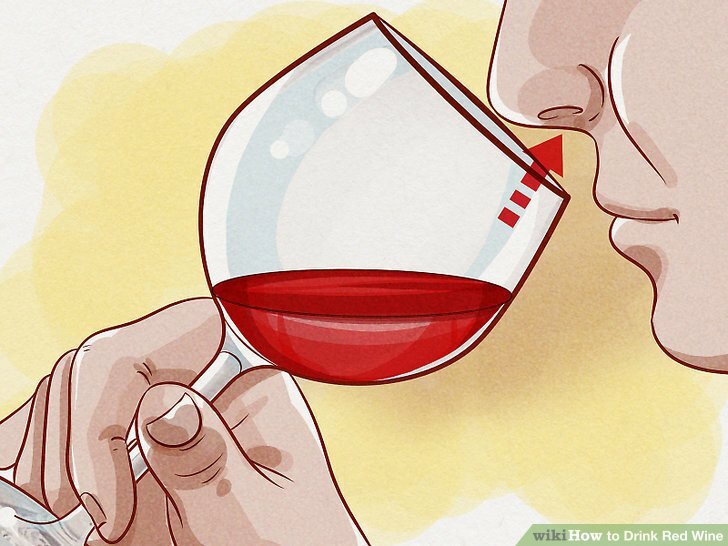 There should be plenty of room in the glass so that you can swirl the wine around and dip their nose into the glass without it touching the wine. A bottle of wine has roughly 10 tasting servings. For a party of 8-10 people, you will need at least two bottles of each wine that you want everyone to taste. Hold the glass by the stem if it has one. 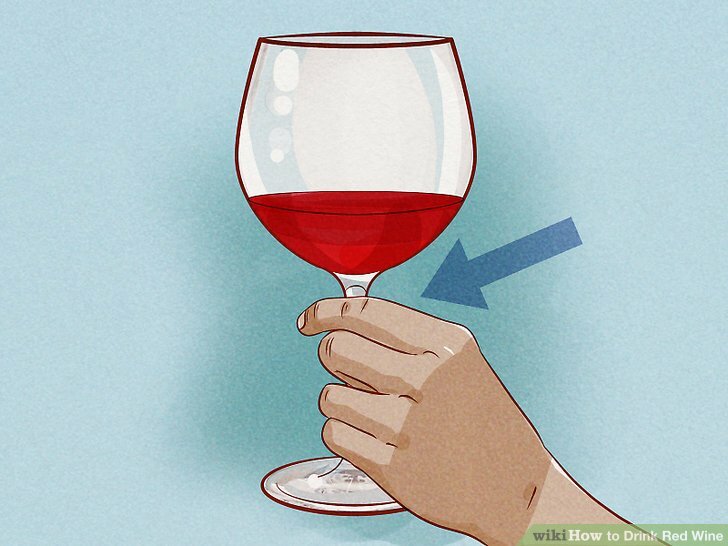 If you don't hold the wine by the stem, your fingertips will heat up the wine and change the wine's flavor. Additionally, you may leave smudges on the wine glass, which is never attractive! Most people hold the glass towards the base of the stem. Grip the stem with your thumb and index finger, and rest your remaining fingers on the base for stability. Examine the color of the wine from every angle. Look straight down the center of the glass to see the depth of the wine’s color. Tilt the glass to the side and hold it up to the light to see how clear the wine looks. Give the glass a good swirl to see if the wine forms “legs” that run down the side of the glass like raindrops. The clarity of a wine will tell you about the quality of its craftsmanship. If a wine is murky, it might have had some problems in the fermentation process or was unfiltered. The “legs” of the wine that are created by swirling it in a glass will tell you how rich and dense the wine is. The bigger the “legs” the bolder the flavors and alcohol content. Smell the wine’s fragrance. A wine’s aroma is an important part of its flavor profile. 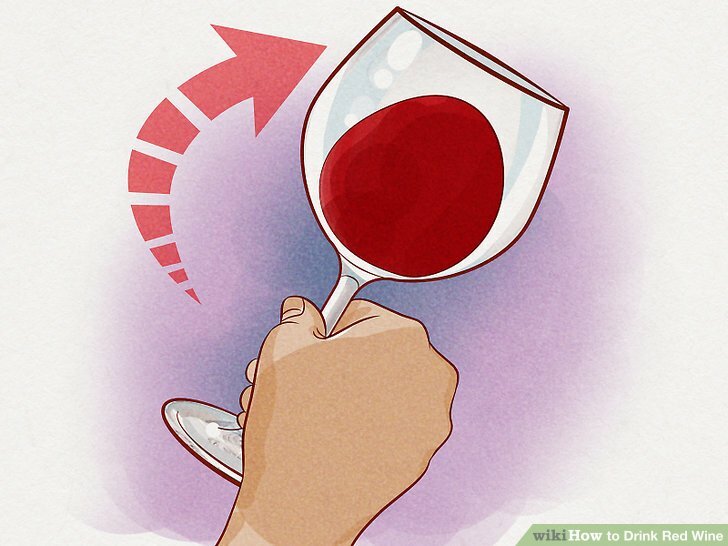 Swirl the wine in your glass to expose more of the wine’s surface area to the air. This brings out the scents and flavors in the wine. Stick your entire nose into the glass and inhale deeply. The senses of smell and taste are closely linked, so be sure to give the wine a good sniff between each sip. It's ok if you don't smell a lot at first! The more you smell wines, the more you'll learn to distinguish individual flavors, like fruity, smoky, and earthy tones. Sip the wine slowly. Hold enough wine in your mouth to completely cover your tongue. 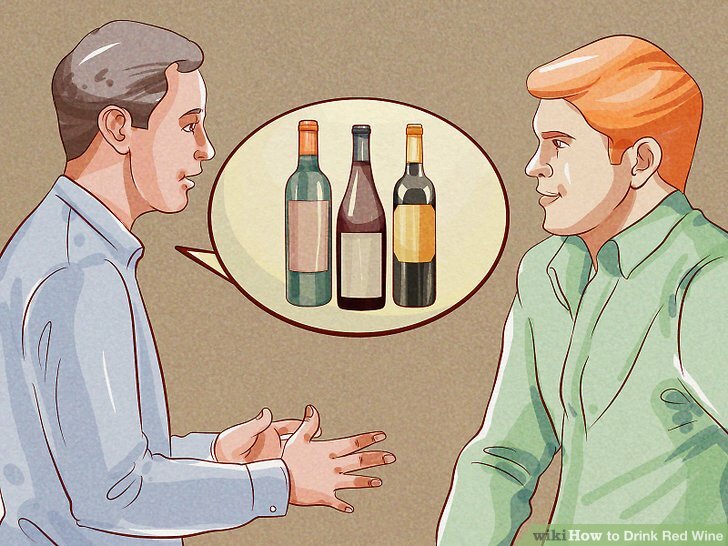 Lightly swish the wine around your mouth so that it coats your entire palate. Swallow the wine after it has been in your mouth for at least ten seconds. You can draw in some air between your teeth to further enhance the flavor. 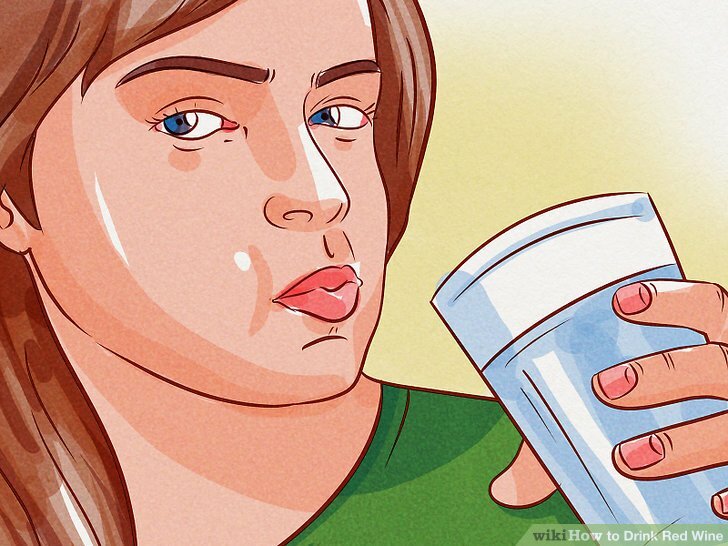 Your tongue only has the four basic tastes (sweet, salty, bitter, and acidic), so pulling air across the wine in your mouth will bring out the aromas that can be detected by the nasal passage along the back of your throat. This is sometimes called “chewing” the wine. Combine Cabernet Sauvignon with red meats. Cabernet Sauvignon goes perfectly with hearty meat dishes like roasted lamb or beef. If you are looking to make a great steak taste even better, try it with a glass of Cabernet Sauvignon. 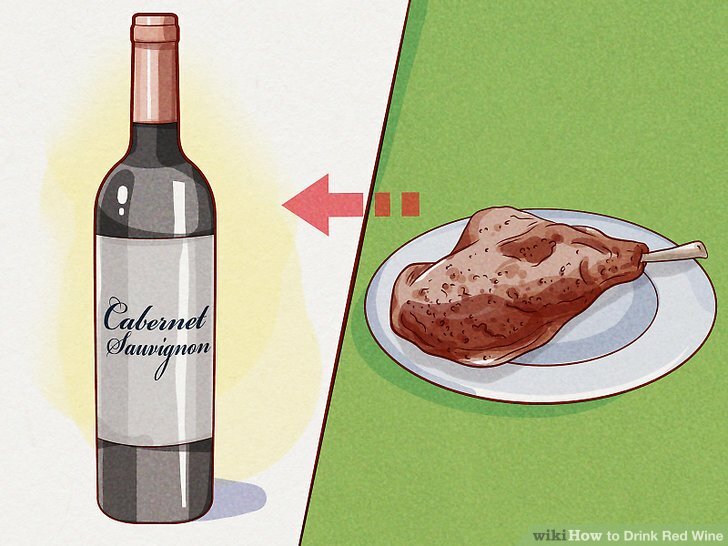 Most Cabernet Sauvignons have strong tannins, which refresh your palate after every bit of meat. Match Merlot with roasted fowl and lighter meats. 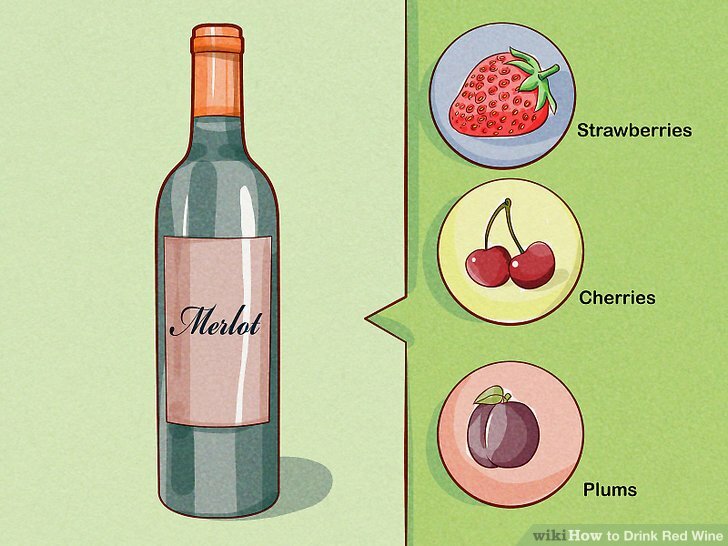 Merlot is a versatile wine and it pairs well with many foods. 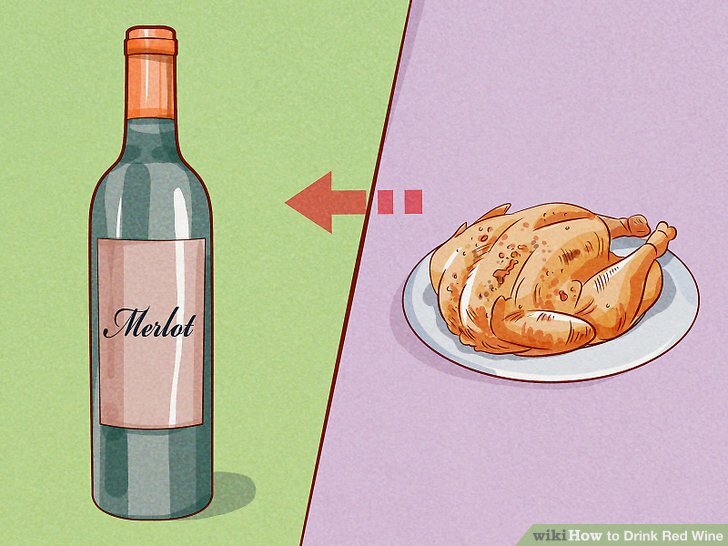 Chicken, duck, turkey, and rabbit are all popular meats that go well with Merlot. It also brings out the flavor in couscous, moussaka, goat cheese, and spicy Chinese food. Merlots tend to be lighter, fruity wines on the sweeter side of the spectrum. If you are eating something that is lighter and salty, chances are a Merlot will pair with it well. Pair Pinot Noir with earthy dishes. 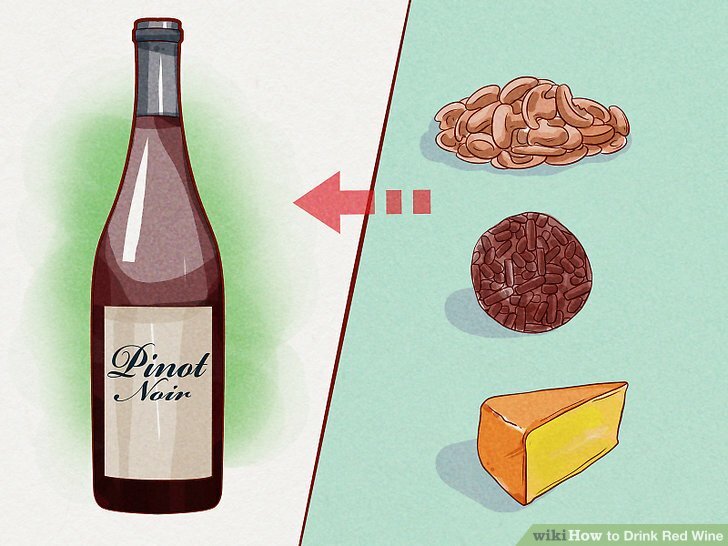 Mushrooms, truffles, and mild cheeses are ideal foods to eat with a Pinot Noir. Pinot Noirs often have a light body but have a lot of savoriness in their flavor, which balances and accentuates the earthy tones in your food. A drier, full-bodied Pinot Noir could also match well with roasted turkey or lamb. 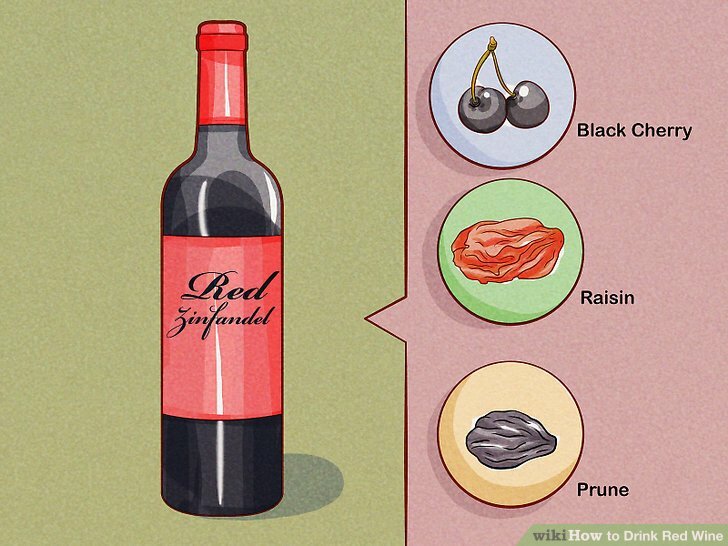 Drink Red Zinfandels with rich and hearty foods. Sauteed mushrooms, roast venison, and pates will complement the depth and complexity of a Red Zinfandel. They also pair well with spicy food and barbecue. Sharp cheeses like Double Gloucester, Aged Gruyere, Havarti, Gorgonzola are also great with a Zinfandel. If you like smoked meats or dishes that incorporate roasted tomatoes, try them with a Red Zinfandel. This accentuates the savoriness of both the wine and the food. Try some Tempranillo with spicy foods. 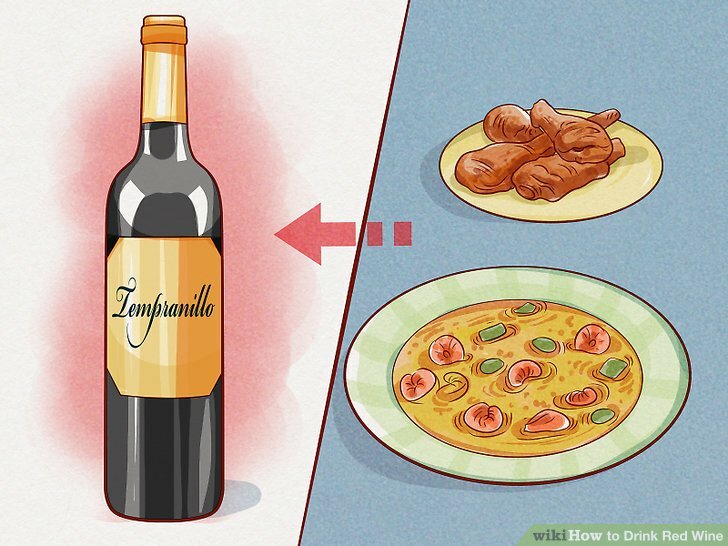 The zestiness of a Tempranillo makes it a great companion with all kinds of spicy food. Indian Curries, spicy barbecue, and even hot wings can be greatly enhanced by a glass of Tempranillo. Cajun food, in particular, goes well with Tempranillo. Try it with some Jambalaya, Gumbo, or a Cajun-flavored steak. Tempranillos are difficult to pair with a cheese. If you really want to serve cheese a Tempranillo, get something soft and smokey like smoked provolone or brie. 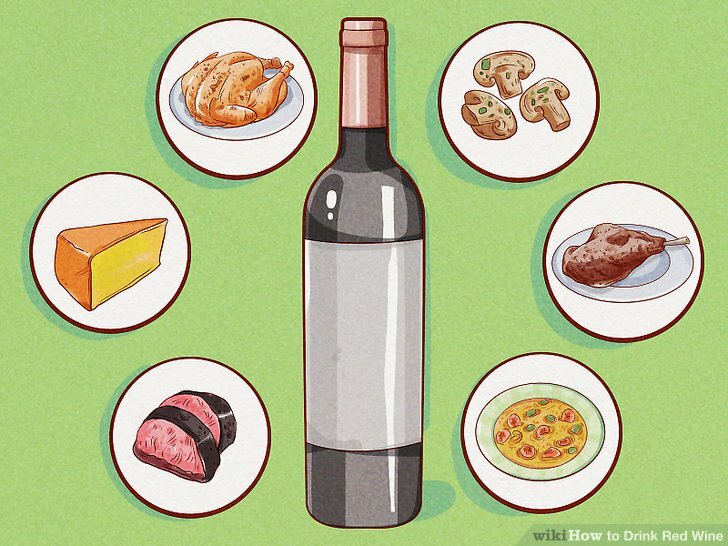 Avoid the foods that don’t pair well with red wine. 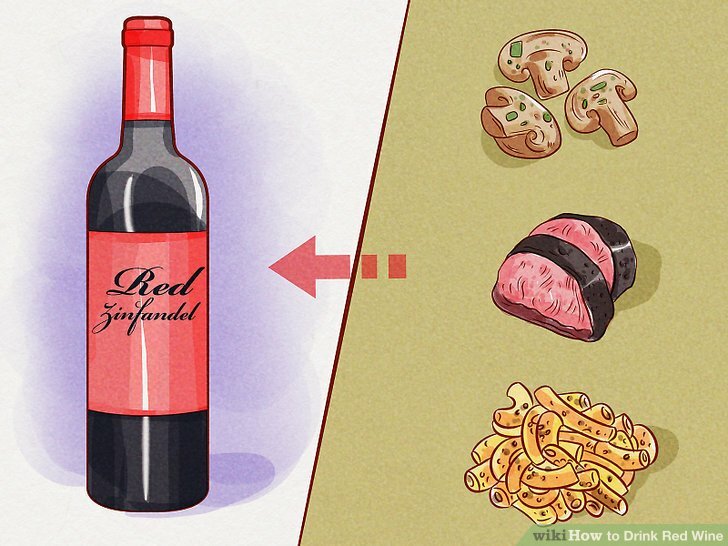 There are some foods that just don’t work with red wines and can end up making both taste bad. This is usually because the flavors are either too similar or to contrasting. Usually, the foods that don’t work well with red wine have a white wine that compliments them well. 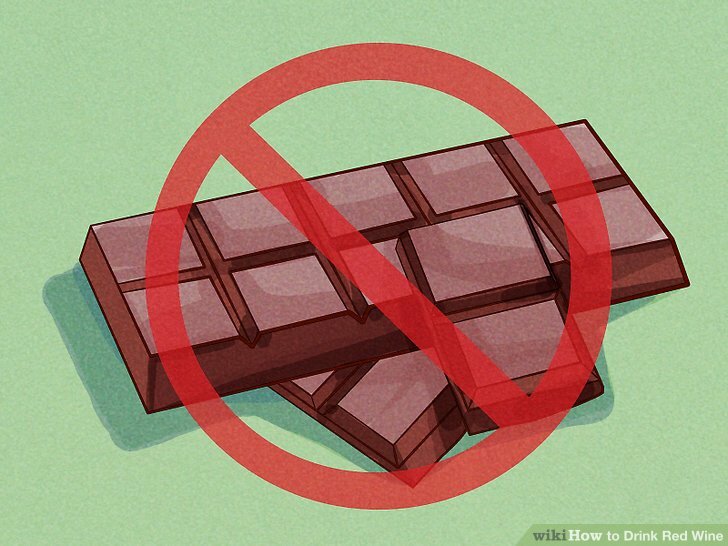 Unless you are drinking a dessert red wine like a port, chocolate doesn’t usually pair well with red wine. This is because the tannins in the wine and the tannins in the chocolate combine for an overwhelmingly bitter taste. Brussel sprouts and asparagus both contain sulfur compounds that make red wine taste like it has gone bad. Even though these vegetables have earthy flavors you might think go well with a red wine, they can ruin your meal if you combine them. Red wines aren’t generally paired with seafood. The iron in red wine attaches with fish oil to create a fishy, metallic aftertaste. Sushi, in particular, can be ruined by pairing it with a red wine. Keep an open mind and experiment. Ultimately, pairing red wines with food is a matter of personal taste. Trying out new combinations can be fun and exciting, and you shouldn’t let conventions dictate what you are willing to explore. Almost every winery will have at least some varietals of red wine, but there will be a lot of variation depending on the regional tastes and the winemaker’s preferences. Nearly all wineries offer wine tastings, but it doesn’t hurt to ask when you are doing your research. 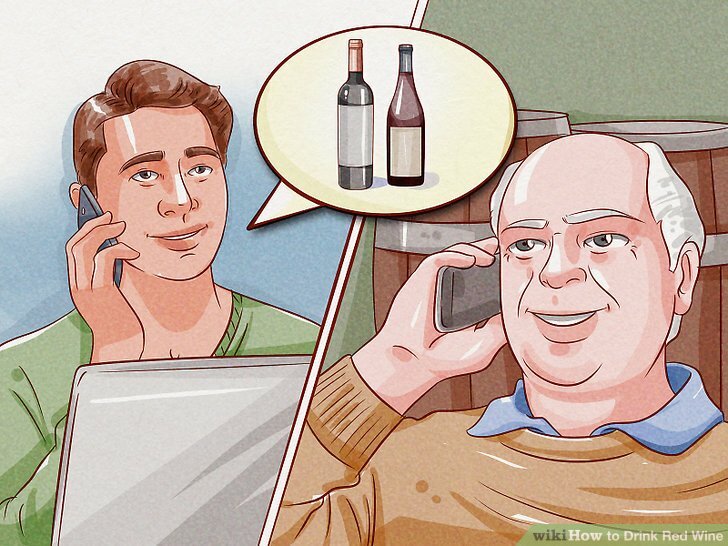 You should also ask if the wine tasting is complimentary, or if there will be a charge. Try several varieties at a wine tasting. The advantage of going to a winery to take part in a tasting is that you will have the chance to try several different wines. Try to sample several wines to help you develop a sense of what you like. 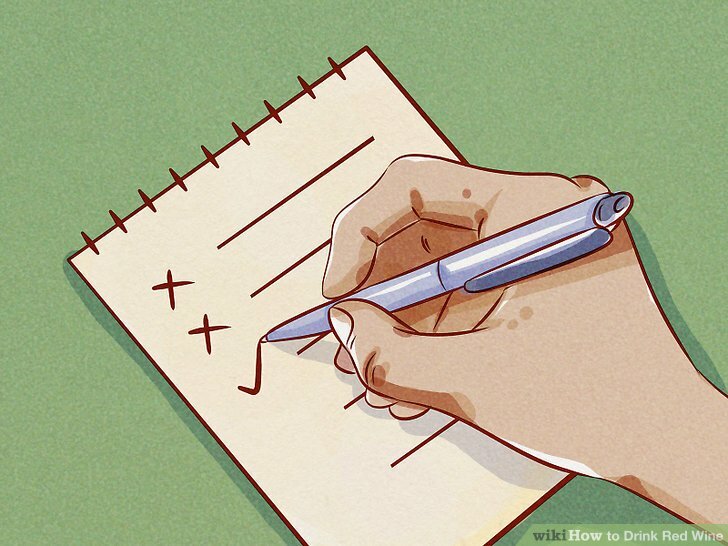 A wine list will usually have the wines in the order you should sample them, but a general rule is that begin with dry wines and move to sweet. 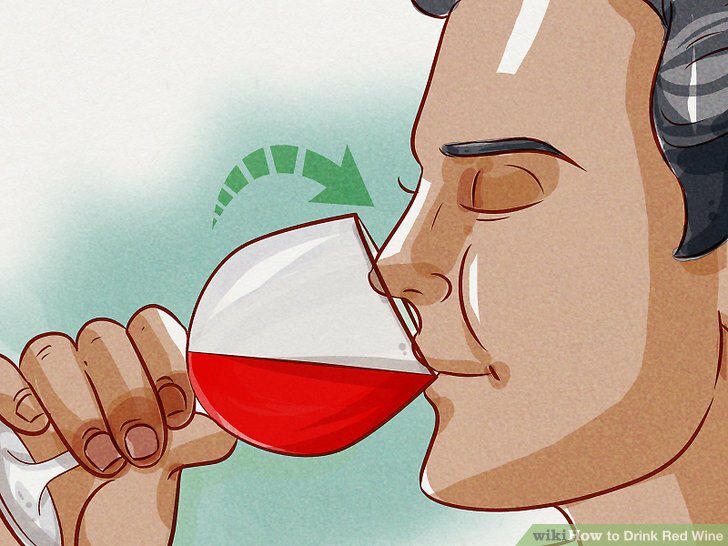 If you do not want to drink all of the wine at a tasting, you can spit it out into the designated receptacles after tasting it. Ask the staff for recommendations. Wineries employ knowledgeable people who tend to really enjoy wine. They can help guide you to certain flavors you might like and make suggestions about what food would go well with your wine. They might also be able to recommend wines that their winery does not have available that you could seek out and try on your own. Cleanse your palate between wines. To really enjoy the differences in the taste, texture, and aroma of red wines, you should use a palate cleanser between each wine that you taste. Often, a winery will often saltine crackers or bread. Eat the palate cleanser and rinse your mouth with a drink of water before moving on to the next red wine. You can also cleanse your palate with some fresh, lightly salted mozzarella cheese. Take notes on your experience to remember your favorite wines. Bring along a small notepad or record your thoughts on your phone. Jot down if you like or dislike a particular varietal and why you felt this way about it. Also, if there are particular flavors, aromas, or textures that you enjoy, you should put them down so that you remember them in the future. Your notes can be as basic or elaborate as you want. You could simply write which varietals you like, or you could make a detailed record of each wine’s flavor profile and make a ranking system. If you're opening a nice bottle of red wine, consider purchasing and using a decanter, which will help the wine "breathe." Let the wine sit in the decanter for about an hour before serving. Do not drink and operate a car or other heavy machinery. If you plan on traveling to a wine tasting, make sure you have a designated driver or spit out the wine after you have tasted it.